JENN McKINLAY: Author newsletters. Love them? Hate them? What's a newsletter? I fall firmly in the love them category, but...I don't want too many of them and they'd better be more than a sales pitch. Give me a peek behind the curtain, make me laugh, share a recipe, a video of your new kitten, and by all that is holy tell me when your new book is coming out. Keep it short and to the point and put the important info first so I can save the letter for later if I don't have time the second it pops up into my inbox. How about you, Reds and Readers? Love the newsletter or hate the newsletter or pretend they don't exist? Tell all and if you subscribe to a newsletter or put out a newsletter that you absolutely love, give us the skinny, the poop, the 4-1-1, and by that I mean -- share the link! Love the newsletter as long as it tells me about the new book coming out . . . I think I’m subscribed to all the Jungle Red ladies newsletters, and I always enjoy reading them . . . . I think I'm already subscribed to the Jungle Reds' newsletters, but I double-checked and sent it in again anyway. I love receiving newsletters that keep me up-to-date on publications, events, signings, and some "peeks behind the curtain." I prefer a monthly letter, and I don't think there ae any newsletters I subscribe to that come more often than that. More than once a month is too much. I’m a quarterly sort of gal. Oh! I guess I'm missing a few there. Thanks, Jenn. Thanks, Edith! I’ll look for yours! I used to write the newsletter for the Dallas Symphony Orchestra, and the best feedback I ever got was from a former DSO president. He was a major donor to arts groups in Dallas, and he got all the newsletters. He told me he always read ours first because he always learned something he hadn't known before. There was NEWS in the newsletter, and he loved it. For author newsletters, I look for info on the next book, certainly, but also what my favorite author is up to. Lucy just posted some pictures on Facebook about learning to make Key Lime Pie. I'd love to read that story in a newsletter. Deb tells a great story about a special meal she enjoyed while researching "A Bitter Feast." Perfect newsletter material! You ladies are among my favorite storytellers. Use your newsletters to tell me stories, and I'll look forward to every one. that's very smart advice Gigi, thanks! News in a newsletter - can I hear an Amen? LOL! Gee, it sounds like I have a fan base. Yes, I will be at Bouchercon. I'm looking forward to meeting all of you, too! Gigi, you are spot on. My favorite newsletters give me a glimpse of what the author is up to personally. And, I loved Lucy's key lime pie pics. That's the stuff for great newsletters for sure. I think Gigi's post is spot on! For instance, after seeing all the great photos of Deb's road trip, I would love a story on the trip. I want News and I want something that gives me a kind of vicarious experience. As a final FYI, I recently unsubscribed to a writer's newsletter. Here's why. I know this woman and I've worked with her on a committee. She is by nature unorganized (We can't all be Marie Kondo). For the fourth month in a row the newsletter started out with the same opening line, "Things are so busy ..." and proceeded to describe some state of chaos. It was exhausting! I'd rather you tell me stories about your adventures in learning to knit plaid, please. Hank- Jenna shared yesterday that she's trying to learn to knit plaid. Perfect story-telling fodder for a newsletter! LOL! I’m trying to knit plaid using Fair Isle style - so far the results are mixed but I’ll keep trying! That must be SO HARD! Yikes. And probably requires math. Louise Penny has been sending me newsletters for years--her travels, husband, dog, and tidbits about her next book. Just the right combination. Yes her newsletters are so fascinating—and I am in awe of how popular they are. Conventional wisdom would be that they are way too long—but I always read every word! Louise has an ability to build a rapport with her readers that is unparalleled - love her! Louise Penny is the only author newsletter to which I subscribe. Follow the Reds here and on their Facebook pages. Only “problem” with both sources is that I don’t want any previews of the next book other than the title and the release date. This is peculiar to me, so I just skip those posts. Always skip “what we’re writing” week here. PSBlogger and Goggle are letting post today for the first time in a couple of weeks. Ah, the joys of tech! We were just talking about that —how so many reviews ruin books by telling too much, Drives me nuts! Thanks for following, Elisabeth! I can admit it - I am a preview junkie. Probably because the writer in my loves seeing the process of other writers so much! Like Margaret, I have received monthly Louise Penny newsletter for years, learning about her life and her writing. She's amazing... on Facebook, too. We do share an awful lot on JRW - it’s our own coffee klatch! I read all the newsletters I get, start to finish, top to bottom. The only one that regularly makes me cry is Louise Penny's. And it never seems like a hard sell. I subscribe only to authors that I read, and to a very small number of those. So many newsletters seem like an advertisement. I already know about the last book, read it when it came out, and I have already ordered the next one when it became available. If there's a WIP, I like to hear about that one too. What I really want to know is the tour schedule, see what you've been up to, interesting personal and professional stuff, prizes won, honorary PhDs, all that. This is a tough one. Right now my mind is so full of stuff I absolutely have to keep track of that I don't have the energy or attention span to read anything that is not pure escapism. Case in point: I paid money for a symposium on sustainable gardening, something I am passionate about, and did not attend the second day at all. I simply could not attend, intellectually. In the 90's I authored and edited (and printed. and mailed) a newsletter for sewing professionals all over the world, and actually charged for it. I put a lot of energy and research into it, because it was a business publication, for business people. Because it was virtually unique, it was a moderate success, but it wouldn't be now unless it was free. But it would also be easier to send via email, instead of pasting up dummies for printing, or using a publishing program to do so. I found that straight content was the best, but that was a professional publication, and not a marketing tool. I agree with Ann about the touring schedule. It needs to be on every author's website, and kept up to date. I hate missing local appearances by favorite authors, or searching for this info and finding it woefully out of date. That's better than a newsletter, even just an email with that information would be helpful. Agreed. An author’s webpage is critical for finding the latest info and it needs to be current and the usability factor should be high. It’s a juggle, truly—because readers may be annoyed by “me me me” in newsletters—and yet, that’s what they’re for! I always tell personal stories and talk about travel plans and events and do giveaways. Just our of curiosity—:-)—What makes you stop reading? And do you read on the phone or computer? On my phone - I do everything on my phone. Oh, and I stop reading author newsletters if they’re whiny, boring, or sell too hard. Does anyone else see the same posts on Facebook and Instagram as redundant? I tend to gloss over both if I see duplicate posts. I'm on Facebook and I'm on Twitter. I find that if I read a post on one site I do tend to skip over it when it appears on the second site. Because I'm am primarily a visual person, if the post uses the same picture, I won't read it a second time. I may have missed some new content because of this but... I initially absorb information at a visual level. I try not to duplicate but there are some people who only do Insta and others who only do FB so it’s a pickle. I read authors’ newsletters on my phone or laptop, but only all the way through if the tone is warm and personal. I want to get to know the person the author is. That’s why Louise Penny’s is so good — she shares herself with me. Like Ann, I cry virtually every issue. Time is precious, so the newsletter intent and content must be genuine connection. I can get advertising elsewhere. I agree! It’s an opportunity to connect - which feels so much more important these days. Mea culpa!!! I let my newsletter lapse! A friend with a long history in PR set it up for me originally, with multiple articles and features, and I just couldn't keep up with it. My webmaster (hubby) took the sign-up tab off my webpage because he said it was embarrassing--which it was. So it has been on my list to get the newsletter going again. Thanks so much everyone for the helpful tips about content!! I'm going to browse everyone else's newsletters and then see what I can put together. And my webpage needs updating, too!!! You are very culpa Deb. I read newsletters, blogs, etc, on my phone only. I’m not reading or posting on Facebook any longer, so if that’s the only place where an author does updates or interacts with readers, I’m not going to know about it. I don’t miss FB! It was taking up way too much of my time. My advice to authors who do newsletters is to be consistent, newsy, and to update book and appearance information. I’ve subscribed to monthly newsletters that appeared maybe three times a year. Sometimes I thought I might have accidentally unsubscribed so I signed up again, only to be informed that I was already a subscriber. 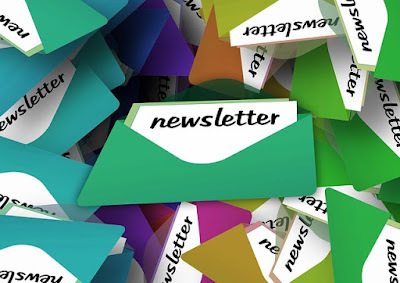 If you can’t manage to send out a monthly newsletter, just inform readers that you have an “occasional” newsletter, sent when you have information to share. To my knowledge, I subscribe to the newsletter of every Red who does one, but I will double check today! I enjoy the ones I receive! I love Louise Penny’s newsletters, and the length doesn’t bother me at all! I save them to read for when I have the time, always looking forward to it. I just got both an new computer and an iPhone 8+, which I can comfortably read on. So it’s the computer and coffe in the morning, bit the rest of the day it’s the phone. Like most of you I want news! I love personal stories, especially if they're funny. Tell me about those surprises or bits of inspiration that wind up in your books. I love to read historical background and oddball items that never made it into our history books. I'm getting a bit of a late start today. I was out covering a concert last night and wrote up the review this morning. That took a bit and now I'm finally getting around to my regular Net activities. To answer Jenn's question, I do like newsletters from authors. I am not subscribed to a whole bunch of them or anything but I do get a few, including Vince Flynn and Laurie R. King. There are others but I can't recall all of them right now. And I agree that they have to be informative, not just pitching me on buying a book. After all, if I'm subscribed to your newsletter, I'm probably already buying your books in the first place. I save some until I have time to give them a proper going over, but if I read it straight away, I usually delete the email after making a note of any information I need to keep track of. And when they have a contest, I enter those of course. As for what I want in a newsletter, news and previews of books are nice. Updated appearance calendars are nice too. If you end up somewhere close to me, I try to get there as a few of the JRW bloggers and posters can attest. Which reminds me, I haven't been to a signing in a while and there's a Kensington Publishing CozyCon in Cambridge on April 13th. I was hoping to get to it since there's at least 22 authors scheduled to attend. Sadly, it doesn't look like it is going to happen. But for those who have the time (and by default, the money) to go, you should! I do read and enjoy several newsletters from authors. Knowing about new books, deals on books, contests, personal details, behind the scenes stories, recipes, giveaways is good. Deborah Crombie, writing the books is more important than writing a newsletter. Edith Maxwell, you weren't kidding. I just got your newsletter. Christabel is so cute. I love newsletters, in moderation. And now I love doing mine! I think of it as a craft, which makes it a creative task, not an onerous one.